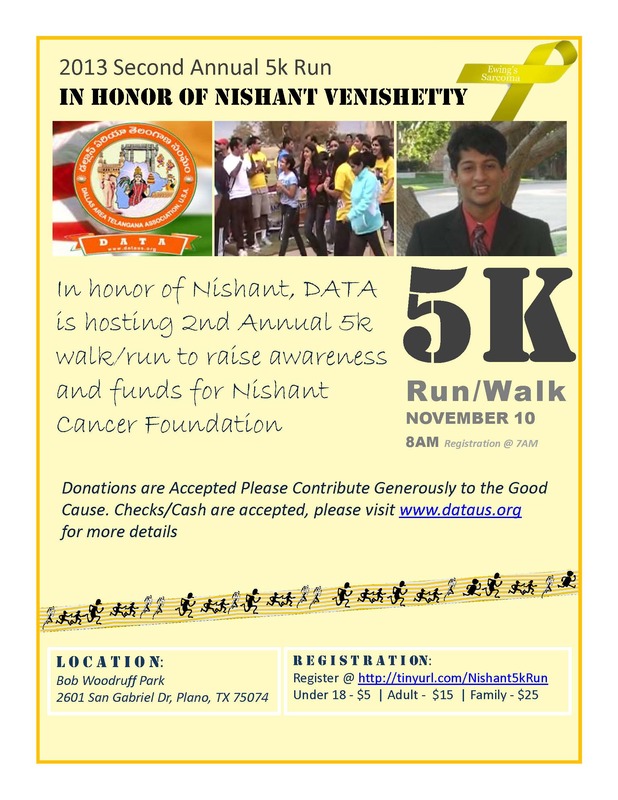 In honor of Nishant Vanishetty, Data supported 5K Run/Walk to rasie awareness of Ewing Sarcoma and raise funds for NISHANT CANCER FOUNDATION. 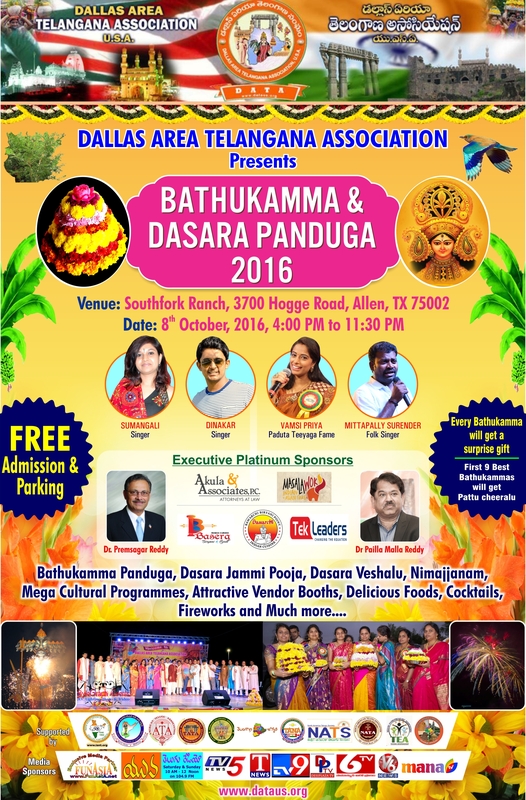 2016 - October 8 - Saddula Bathukamma and Dasara Panduga. Saddula Batukamma - The ninth day is on Ashtami, eight day of Ashwayuja month. The Goddess on this day is worshipped as Sri Raja Rajeshwari Devi for victory over evil and happiness. Color of the day is Purple. Five types Naivedyam is offered on this day; Curd rice, Tamarind rice, Lemon rice, Coconut rice and Nuvvula Rice. 2016 - October 7 - Vennemuddala Bathukamma Panduga. 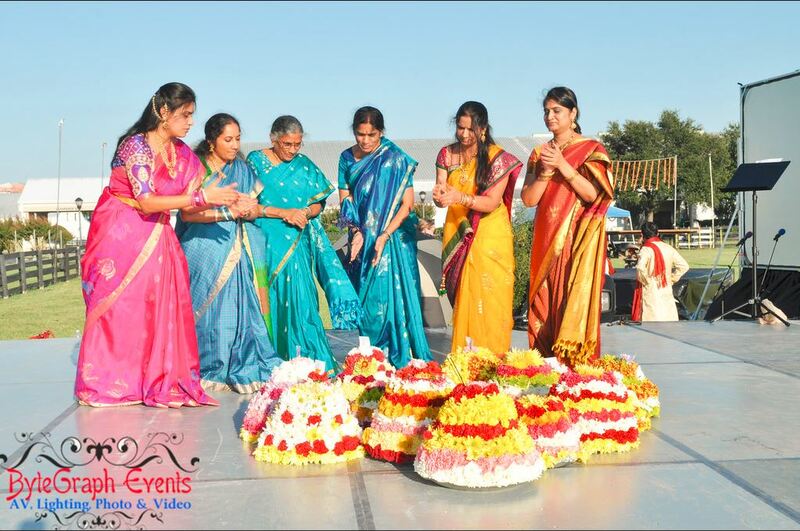 Vennamuddala Batukamma - The eighth day is on Sapthami, seventh day of Ashwayuja month. The Goddess on this day is worshipped as Mahishasura Mardhini for removing all past, present and future sins and to make us purified. Color of the day is Blue. Naivedyam is offered on this day is a mixture of Nuvvulu, butter and Jaggery. 2016 - October 6 - Vepakayala Bathukamma Panduga. Vepakayala Batukamma - The seventh day is on Shashti, sixth day of Ashwayuja month. The Goddess on this day is worshipped as Durga Devi for power to do any work. Color of the day is Blue. Naivedyam is offered on this day is rice floor shaped in to fruits of neem tree and deep fried. 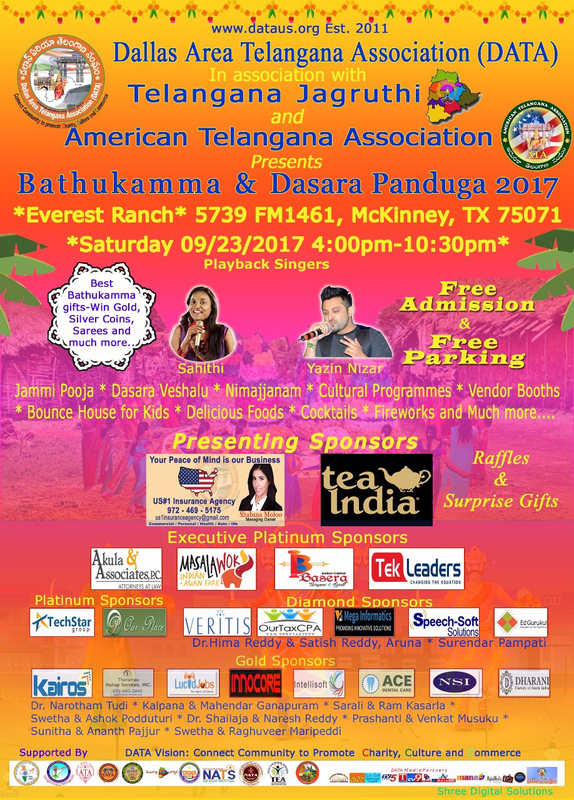 2016 - October 5 - Aligina Bathukamma Panduga. Aligina Batukamma - The sixth day is on Panchami, fifth day of Ashwayuja month. The Goddess on this day is worshipped as Saraswathi Devi for knowledge and education. Color of the day is Red. Any Naivedyam is offered. 2016 - October 4 - Atla Bathukamma Panduga. Atla Batukamma - The fifth day is on Chaturthi, fourth day of Ashwayuja month. The Goddess on this day is worshipped as Sri Mahalakshmi Devi for material and spiritual wealth. White is the color of the day. 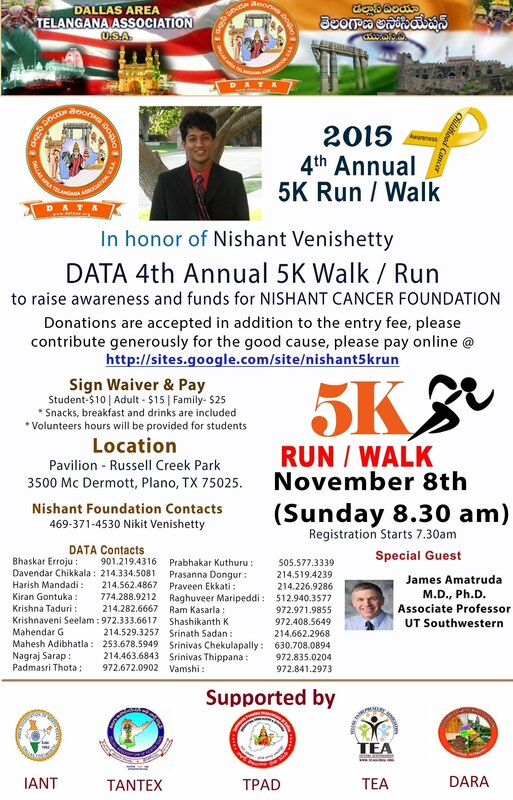 Naivedyam offered is atlu or dosa. 2016 - October 3 - Nanabiyyam Bathukamma Panduga. 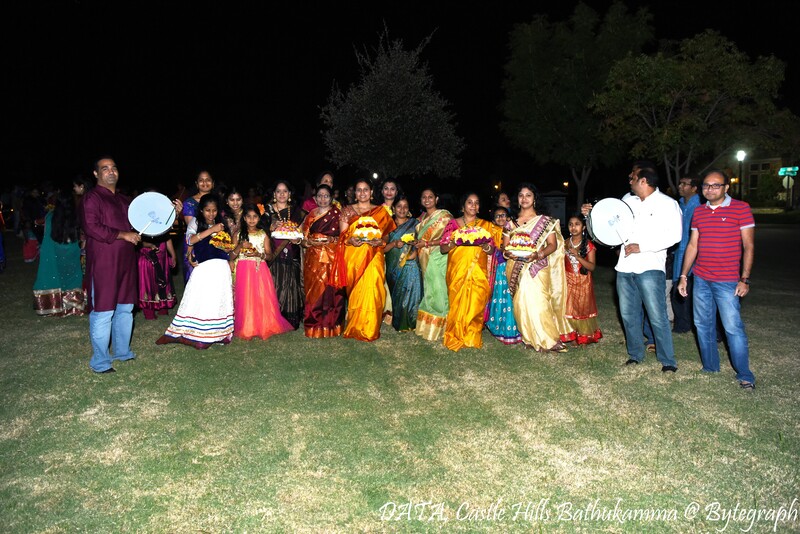 Nanabiyyam Batukamma - The fourth day is on thadiya, the third day of the month Ashwayuja. The Goddess on this day is worshipped as Sri Lalitha Devi for Peace and Serenity. Orange is the color of the day. Naivedyam offered on this day is mixture of wet rice, milk and Jaggery. 2016 - October 2 - Muddapappu Bathukamma Panduga. Muddapappu Batukamma - Third day of Bathukamma is on Vidiya which is the second day of Ashwayuja month. The Goddess is worshipped as Gayatri Devi for providing Panchabhutas, the essential things for humanity. Grey is the color of the day. Naivedyam offered on this day is a mixture of Muddapappu, milk and Jaggery. 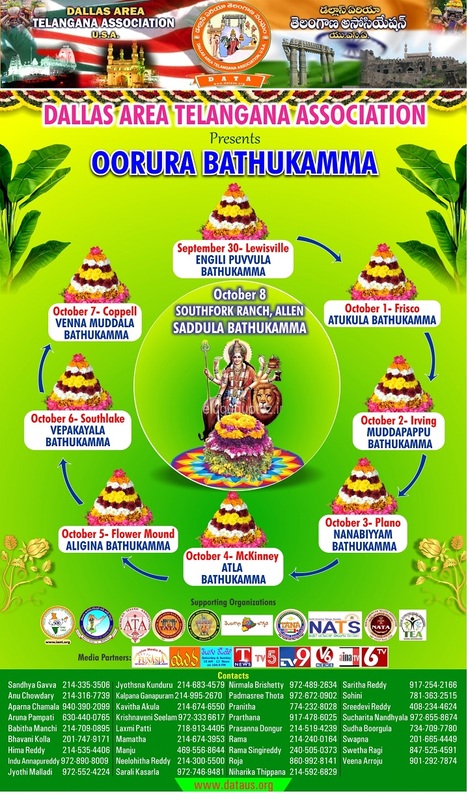 2016 - October 1 - Atukula Bathukamma Panduga. Atkula Batukamma - Second day is on Padyami which is the first day of Ashwayuja month. The Goddess is worshipped as Annapurna Devi for her kindness as a mother. The color of the day is Green. Naivedyam offered on this day bland cooked lentils, Bellam and Atukulu. 2016 - September 30 - Engili Puvula Bathukamma Panduga. Engili Puvula Bathukamma - First day of the festival celebrated on Mahalaya Amavasya or Pethra Amavasya. The Goddess is worshipped as Balatripura sundari Devi for strength, wealth and knowledge. The color of the day is Yellow. Naivedyam offered on this day is mixture of Nuvvulu and rice flour. 2016 - From September 30 To October 8 - Oorura Bathukamma Panduga. 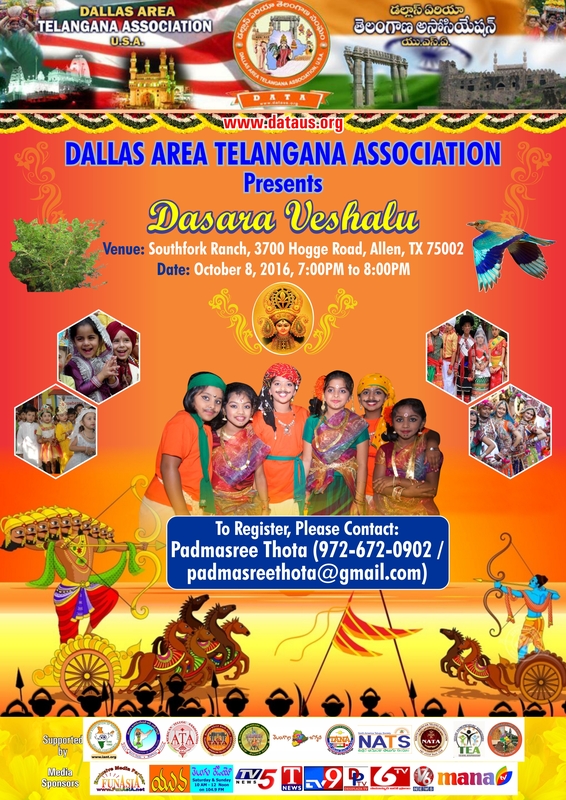 2016 - Bathukamma & Dasara Kick-off Meeting on Friday Aug 19th 2016. 2016 - Telangana Formation Day Celebrations. 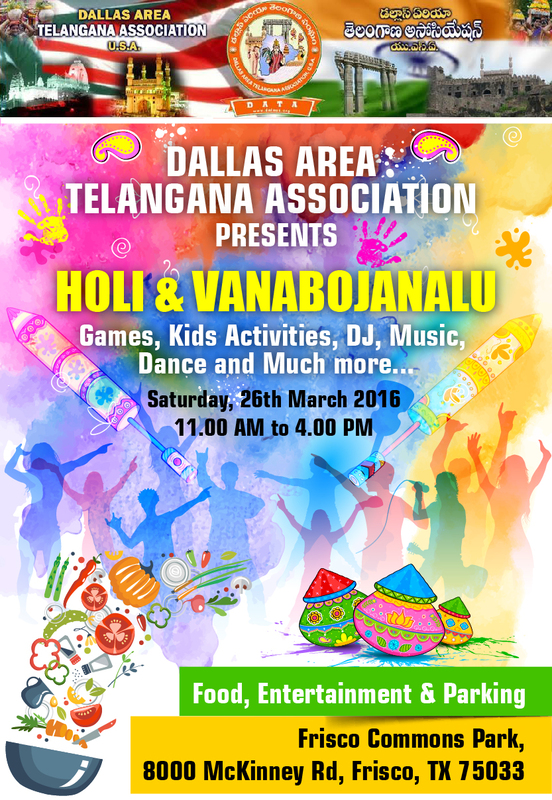 2016 - HOLI & Vanabojanalu March 26th 2016. 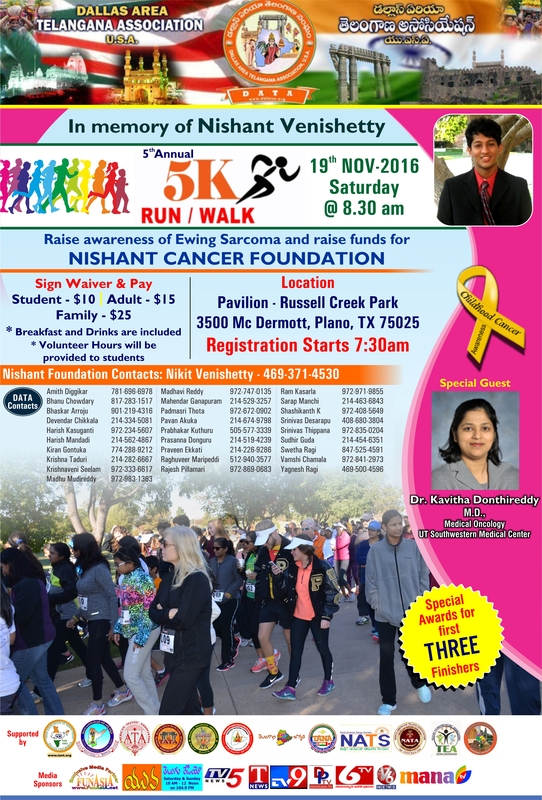 2015 - 5k Run/Walk Nov 22nd 2015. 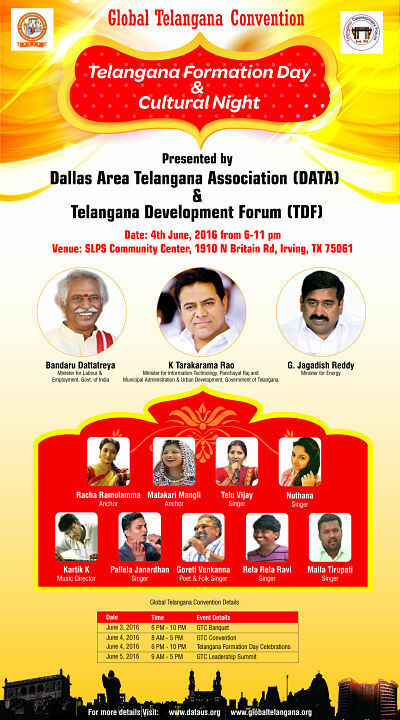 2015 - Telanagana formation day June 14th. 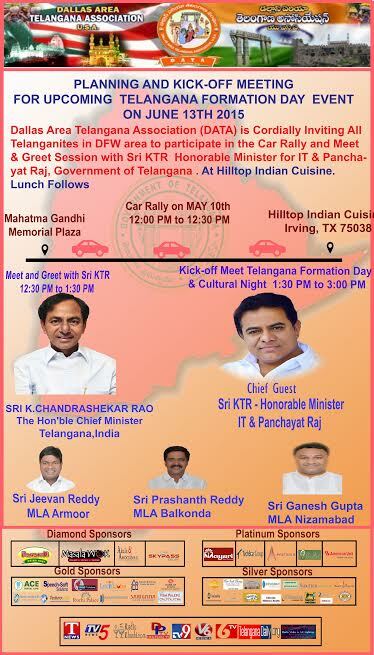 2015 - Kick-off meeting Telanagana formation day May 10th. 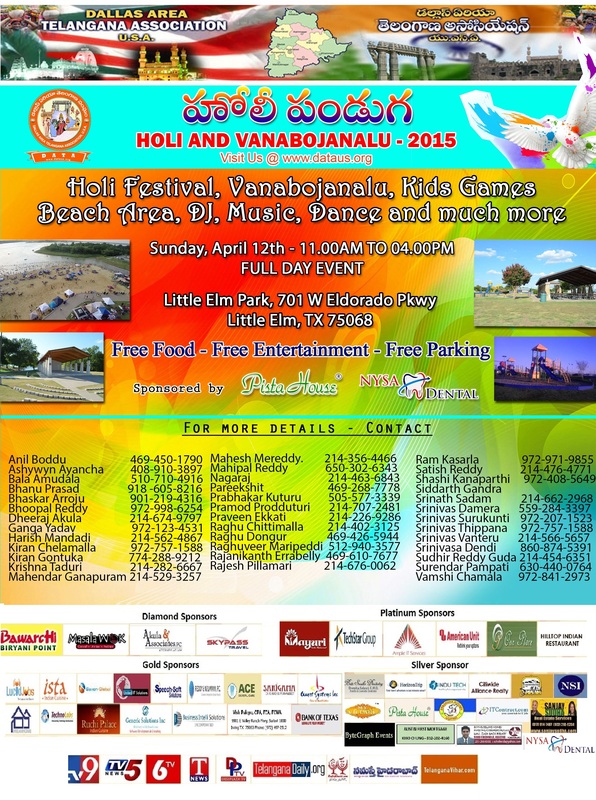 2015 - HOLI & Vanabojanalu April 12th 2015. 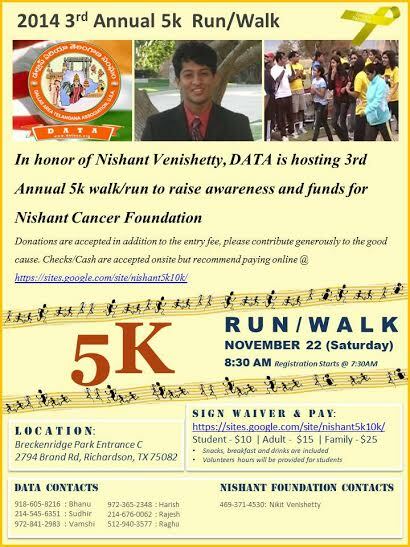 2014 - 5k Run/Walk Nov 22nd 2014. 2014 - DATA - Bathukamma & Dasara Panduga. 2014 - 2nd Annual Fundraising Event Aug 2nd 2014. 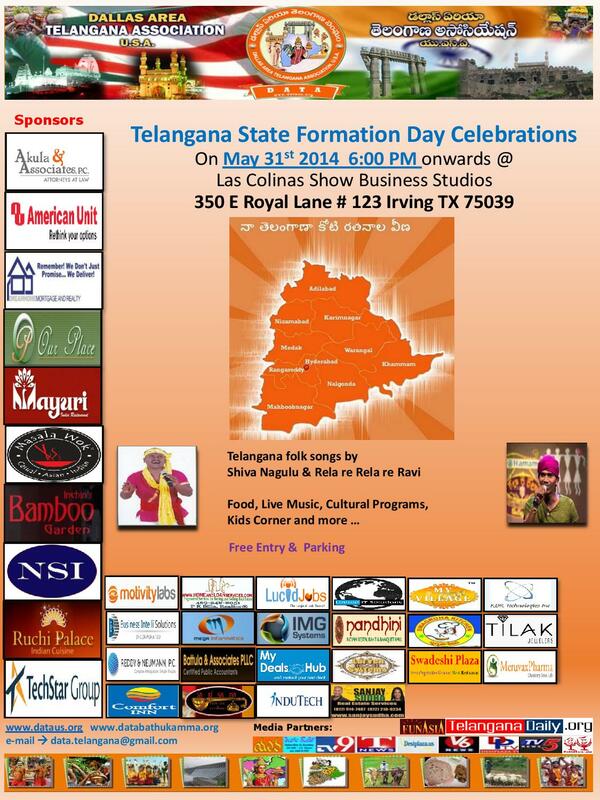 2014 - Telanagana State Formation Day Celebration May 31st. 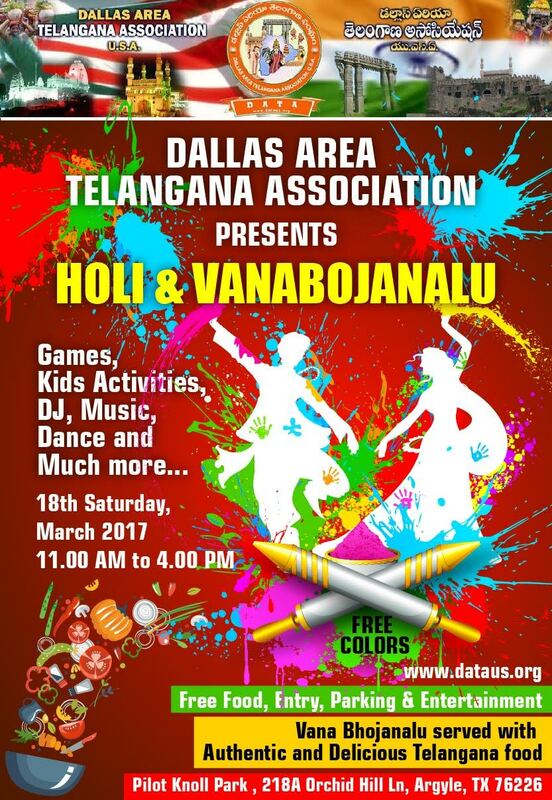 2014 - HOLI & Vanabojanalu March 22nd 2014. 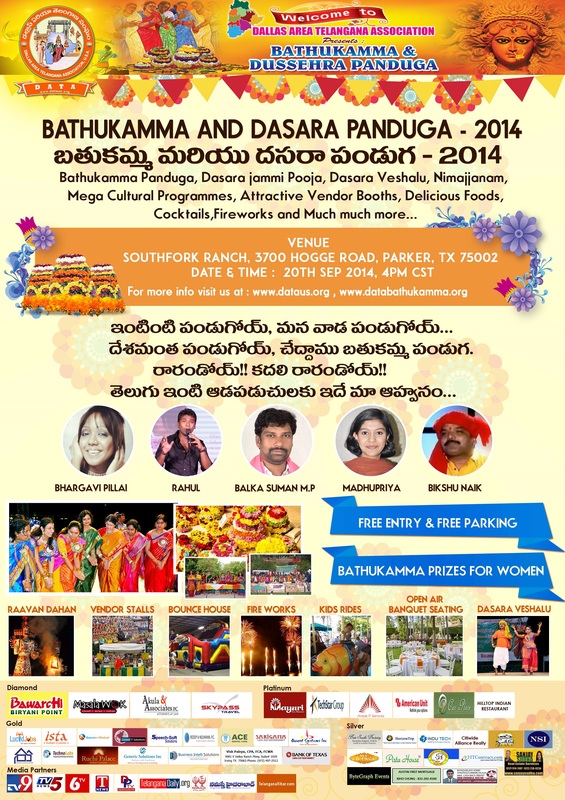 2013 - Bathukamma & Dasara Panduga Sep 28th. 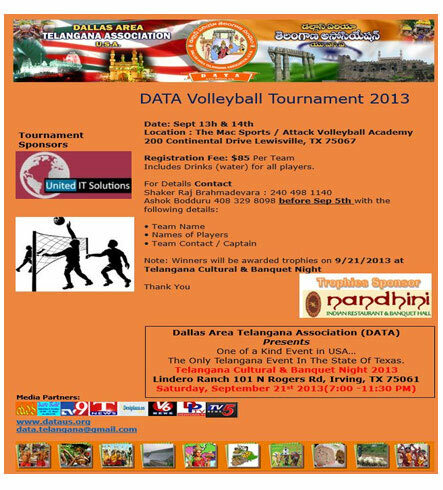 Click here for DATA Sponsorship Kit.